Hidy Ho, and Happy 2016 everyone! It has been a long time since I’ve put anything out here in the old ether, but November and December are typically very busy months for me, and I thought it best not to drive myself crazy just to produce something sub-par I would regret, when I could hold off and really put myself back into my work at the start of the new year. 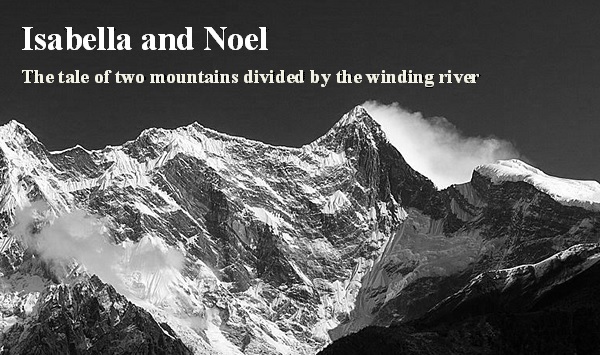 I hope you enjoy this latest installment of The Tale of Two Mountains, and may this new year bring you peace, love and joy! “The wanderer lives,” Isabella swore through her teeth, shivering with cold, guts clenching against the emptiness Moag had left in her as she pushed herself up from the ground with her good arm, the other hanging stiff, awkwardly gripped by the rigor of death that crept slowly through her veins, as she tried to force her feet beneath her to stand. “Fly, Noel,” she groaned, using every bit of strength she had left to push herself upright, but she was far too weak, her head was full of a strange pressure, and as it swam it seemed as though her ideas were not fully formed, weighted down by the absence of some necessary volition, though she knew what she was thinking. She lifted her hand up from the ground and tried to take a careful step but fell forward, her face meeting the floor with a violent crack. Ears ringing, eyes burning, she lay still a long moment, swallowing the blood that gushed into her mouth. It should have frightened her that there was so much of it, but all she could think was that her own blood tasted sweeter than the wanderer’s, and the sound of her laughing sobs filled the dormant bleakness of the room, dancing with the stench of mildewed flesh, a part of her and not a part of her, barely clinging to the world. Somehow, up there in the horrible grasp of Moag’s nightmare, the wanderer had felt her crying out to him in dread. It should have been impossible for someone like him, but then the Mardraim was right, she thought, emboldened by the pulsing sting of her jaw. She wiped the blood and tears on her arm and rolled up onto her elbow to try again. It would have been impossible, she reasoned, inching her knees across the ground, using her good arm to thrust herself forward, painfully aware her crippled momentum did little but set her off in a hapless squirm. She could feel the skin on her elbow and knees tearing against the stone as she struggled, though it did not hurt as it should. Moag had done too much damage. Better to her than the wanderer. Noel, had felt her crying out to him through the terrible void, and as though Moag, too, was perplexed by the impossibility of their conundrum, the ancient hand of time had let loose its hold on her. How? Did the how of it even matter now or would her time be better spent relishing these few sacred seconds of freedom, the millimeters of progress she made toward the door and the throbbing ache in her head, a sweet reminder that she was still real, for now? Her end was quickly catching up to her. She could feel Moag waiting. It was not consciousness. Like Fate, it did not feel, but she could sense in it the anticipation of her undoing, as though she were water pooled on a ledge and the slightest shift in gravity would send her spilling over, and it was the space into which the pool would become a stream, where it was already a stream, where it had always been a stream. All she could think to do was to go and meet him, this curious elf who had undone her destiny. He had heard her cry and awoken, she smiled with the thought, hurrying now as fast as she could push herself across the ground, spluttering more blood from her nose as she went—woken from a dream it seemed he had been dreaming since long before the waters of Fate washed over the world, long before the snake that pursued her now began eating its own tail, before there was even the idea of a soul for it to one day devour, before there was day to define the night, before time, before before… He woke, and Isabella knew the truth, though she found no solace in the knowledge of her newly formed current—knew the truth of the matter deep in her soul, more deeply than she had ever known any design of Fate as an augur, as though she had known it for as long as that stranger had been dreaming. Noel had to live—he would live. Whether she had done it because she chose to or had done it because she was compelled by some force greater, even, than Om and Moag, Isabella had saved his life, become entangled in his purpose, as the Mardraim said, and soon she would surely die. She would cease to exist, in order that the wanderer would live. That was all that mattered. As though ignited by a spark, Noel tore through the void faster still, streaming like an electric current over the surface of her. Isabella laughed again, soothed by the thrill of his flight racing across the expanse, toward her and away from her and through her all at once. “Hurry,” she managed to say, but Moag caught up the thread of her once more, and her very thought became a spasming wail of agony, cutting through the deafening emptiness, reaching out to Noel, willing him onward as her body shook against the ground with a venerable tempo, beating like the maddening roil of a first deadly thunder, as Moag drank deep, swallowing great gulps of her. She would die; first, she would die. Then she would cease to be. Two hands took her up. Two arms embraced her, holding her tight, fighting to keep her close as she thundered, and he ran. “You cannot do this! Think of the children!” she heard a long, faint cry somewhere far away. His feet pounded against the floor, becoming the thunder. “Think of Fate! We cannot allow the elf to do this, if there is any way of stopping him!” the Mardraim answered. He was not protecting himself, and she could do nothing to protect him. He felt her. He felt everything. He knew there was no way they could stop the wanderer. He had known it all along. “Harvey, no.” It was Isabella’s voice that spoke now, but where it came from or how, she did not know, for it sounded as though it were from somewhere else, hidden away in some unworldly existence. “Young Harvey, where are you going?” the youngest mother said, calm as ever. “Stop! You cannot go down there!” the eldest mother cried. “I must,” Harvey answered, his voice vibrating against Isabella’s soul. Someone screamed. The wanderer? Isabella? She opened what were once her eyes, to watch the domed lapis ceiling of the entryway glittering past so slowly, a dozen days might have come and gone as the scream carried through the depths of her. He turned down one of the archways, which led into a natural tunnel, worn smooth by the ages old, millennial flow of the waters of Fate. Voices followed close behind, becoming burbles of insistence and impatience, echoing words lacking form. “I will not allow her to be taken,” he said. After a thousand years he answered, “Moag can have me. It should be me. Not you.” And he smiled at her, laying down her body, by now very nearly turned stone, so it could beat at the edge of that darkness, so deep, so impermeably black, to end and begin at the gaping mouth of the eater of souls, that grandfather snake, all consuming, and as she quaked loose the dust of a trillion atoms, her senses lost, her self lost, save for Harvey, he pressed his lips against what was left of hers. Then he stepped into the Moag.